Tax day: Is it better to file today, or ask for an extension? It’s April 15: tax day. By midnight, Americans have to file their taxes or apply for an extension. The IRS requires anyone who owes the government money in their taxes to pay by midnight, even if they file for an extension. With that rule in mind, a lead tax research analyst at Kansas City-based H&amp;R Block said it’s easier to complete taxes today instead of pushing it back another six months. It’s April 15: tax day. 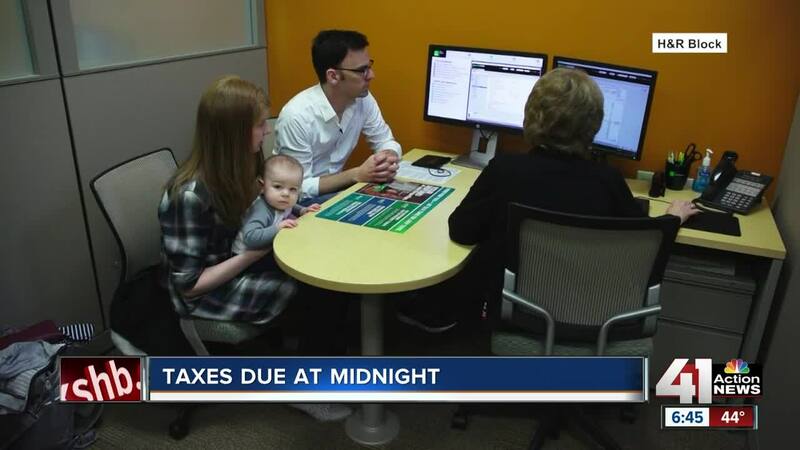 By midnight, Americans have to file their taxes or apply for an extension. The Internal Revenue Service requires anyone who owes the government money in their taxes to pay by midnight, even if they file for an extension. With that rule in mind, a lead tax research analyst at Kansas City-based H&R Block said it’s easier to complete taxes today instead of pushing it back another six months. "If you're going to have to go to the trouble to actually figure out what you owe, you might as well file your return, get it over with," said Nathan Rigney, a research analyst. "And you may discover in fact you get a refund." He added most Americans are seeing a smaller tax return, or owe the government for the first time, but they received more take-home pay during the year. To avoid having to pay next year, Rigney suggested looking at your withholding. It's the amount of money your employer keeps from your paycheck to pay the government on your behalf. You can fill out a W4 to change your withholding. Depending on your changes, come this time next year, you may be getting a check instead of writing one. "[If you don't, the amount you owe] might even be a little bit worse just because of the way the withholding tables were implemented last year for only half of the year. This year, it will be for the full year," Rigney said. The stories of people receiving smaller refunds than past years is part of the reason some Americans haven't filed their taxes yet and will be rushing to tax preparers Monday. "A lot of people come in, especially this year with the new tax law, with a little bit of anxiety, not sure how they're going to be impacted," Rigney said. "Being able to explain to people how they'll be impacted, answer their questions and put them at ease is what we do." Because you can file your taxes online, you have until midnight to submit the necessary documents to the IRS.